So with 5.1 and 5.5, the vCenter components included were Single Sign On, Web Client, Inventory Service and the vCenter Server. These components could be deployed all on one single machine, as a simple install. If we wanted redundancy, or removing one single point of failure, we had the choice to deploy each component on a different machine. We also had a choice to mix the installation, grouping certain components on certain set of machines. 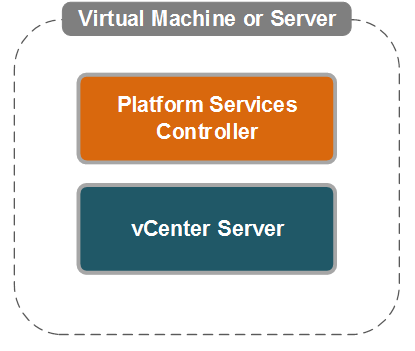 With vCenter 6.0, we have a concept of Platform Service Controller (PSC) and Management Server Node. 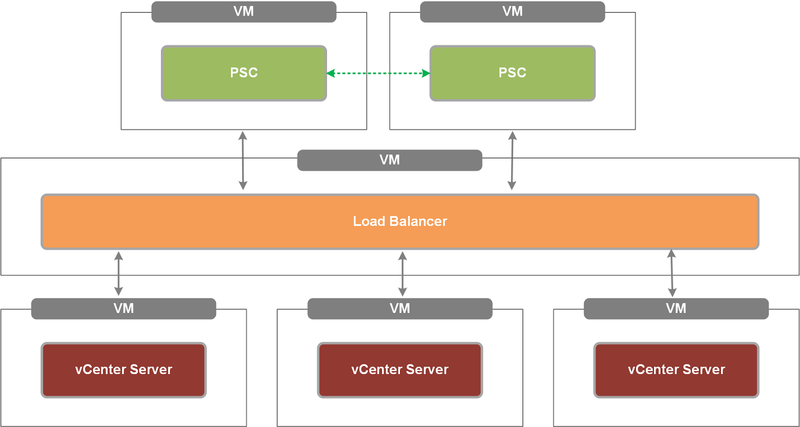 With PSC and Management server into picture, most of the vCenter 5.x components have been consolidated into these two services. 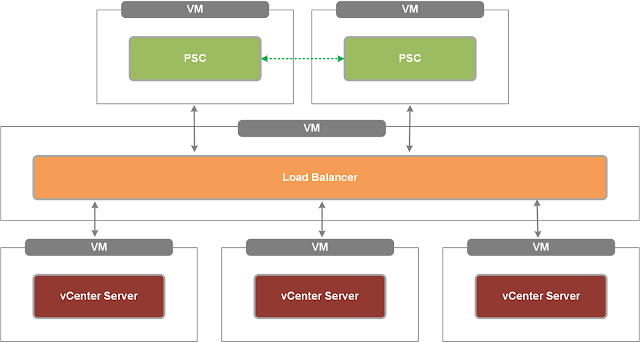 In embedded PSC deployment, you have the PSC component and the vCenter component residing on the same machine. This can be a physical machine or a virtual machine managed by an ESXi host. This type of deployment is used for small environments and it is the easiest of all deployments. Maintaining embedded PSC deployment is pretty easy. However, it comes with certain drawbacks such as single point of failure and replication between multiple embedded nodes is not supported. This type of deployment is supported both on Windows and Appliance based vCenter. Using this type of deployment, you can have multiple vCenter Servers (Management server node) being managed by or connected to one PSC node. 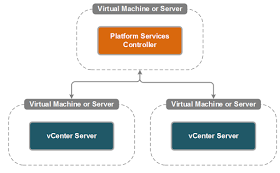 Using this mode, you can deploy a vCenter Server in a linked mode with two or more vCenter Server connected to the same PSC instance. Both the vCenter Servers are connected to the same PSC domain. This type of deployment is also known as Enhanced Linked Mode with External PSC Without HA. In the previous deployment type, if the PSC node goes down, then the vCenter authentication fails. In PSC with HA type deployment, the PSC node is made fault-tolerant by adding another PSC node. Both these PSC nodes reside on a VM of their own and is configured to reside behind a Load Balancer. The vCenter Servers are joined to the PSC domain using the load balancer IP which is shared among the multiple PSC nodes. So, in this case, even if one PSC node goes down, the authentication for vCenter nodes can be provided from the other PSC nodes. 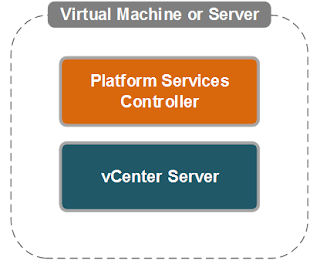 This configuration can be configured again for both Windows and Appliance base vCenter. These 3 types of deployments are supported and recommended by VMware. As we saw earlier embedded PSC with Linked Mode is not recommended. However, the deployment can still be done for a test environment. Here you deploy your first embedded node (PSC and Management Node) on a single physical/virtual machine. You then deploy the other embedded nodes, with their embedded PSC configured to the domain of the first embedded Node. In this type of deployment, the first node is an embedded node. On the first node, the PSC and Management Server are deployed on the same virtual machine. In this type of deployment, the first node is again an embedded PSC node. The second node does not have a PSC. The second node is just a Management Server node, and this node is connected to the embedded PSC domain. If there is just one vCenter instance that is required then you can go for embedded PSC deployment. You can make node Fault-Tolerant by using VMware HA or Fault Tolerance. Small environments will fall into the category of embedded deployment models. In this, currently you have a simple install of a 5.1/5.5 vCenter. That is, SSO, Web Client, Inventory Service and vCenter all on the same machine. This vCenter machine needs to be upgraded to 6.0 with Embedded PSC. As mentioned above, in embedded PSC the vCenter and SSO all reside on the same machine. So the upgrade process would be straightforward. Mount the ISO and upgrade the PSC first and then the management next. In this scenario the 5.1/5.5 again is a simple install. However, when upgrading to 6.0, you want the PSC to be on a separate machine to provide Enhanced Linked Mode capabilities. Uninstall the older version of 5.x SSO that was residing on the original simple install machine as this is not being used anymore.